While incumbent President Serzh Sargsyan has been announced the winner in the February 18 elections, his main challenger, Heritage party leader Raffi Hovannisian, out-performed the president in some precincts that have traditionally been pro-government. On Tuesday during a special session the Central Election Commission summed up the presidential election preliminary results (the turnout at the election was 60.18 percent). After counting the ballots at 1,988 polling stations, it became known that Sargsyan received 58.64 percent of votes, while Hovannisian got 36.75 percent. But key voting districts swung in favor of the challenger. Perhaps most significant was precinct N.1 in the Nor Nork district of Yerevan, home to (Republican) Mayor of Yerevan Taron Magaryan. There, Hovannisian received 15,752 votes to Sargsyan's 15,383. 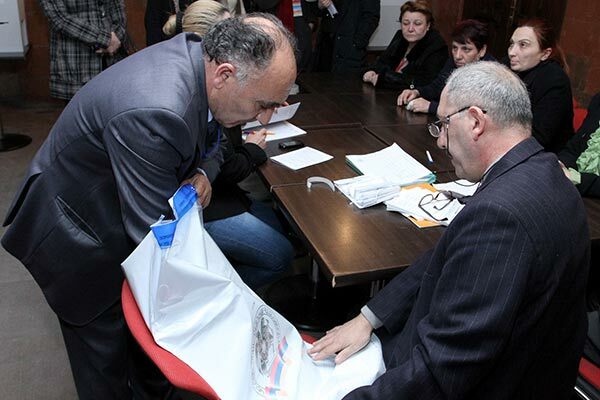 And in another crucially pro-Repbulican precinct, N. 4 covering Yerevan’s Arabkir community, Hovannisian received 14,051 votes versus Sargsyan’s 13,827. Hovannisian’s votes dominated also at precinct N.7 (which includes part of the Malatia-Sebastia and Ajapnyak communities). Sargsyan received major support from Yerevan’s Erebuni and Nubarashen communities (20,548 votes from precinct N.13). In this district polling station 13/34 is located, right in front of an army unit, hence 75 percent of voters were servicemen from various parts of Armenia. Out of 1,196 voters 986 supported Sargsyan, while 149 voted for Hovannisian. The opposition candidate repeatedly spoke during his campaign about the government pressure on soldiers and public servants to vote in favor of their commander-in-chief, and accused Sargsyan of abusing administrative resources to assure that soldiers and civil servants voted for the ruling regime. Election watchers find it surprising that Hovannisian got even the 149 votes. Provinces of Armenia, too, did not stay indifferent to the candidate, who stood out for his direct communication with people during the campaign, his human rights advocacy and democratic methods. In particular, Armenia’s northern Lori province with its regional center Vanadzor gave Hovannisian 18,688 votes versus Sargsyan’s 10,588. Still, the biggest support was extended to Hovannisian in the Shirak province (Armenia’s second largest city of Gyumri is the regional center): precincts N. 33 (14,471), N.34 (22,120) and N.35 (18,443). At the same precincts covering several communities Sargsyan received 13,995; 9,693, and 9,517 votes, respectively.